High-definition and standard video formats. High quality cable, works great. I have bought cables direct from monoprice before and like this one, very good quality, very thick total width cables. This one works great to connect my dvi graphic card connection to my new viewsonic monitor after my previous viewsonic quit working after 8 years. I knew i wanted to purchase a new monitor with hdmi connection for sometime when i do upgrade my computer i will have the best (in my opinion) type of connection for video and audio. This cable arrived quickly as it most things do from outletpc and hooked right up between my computer and monitor with no problems. A great cable at a really good price for it quality. Don't be duped by the hype about expensive hdmi cables. Nobody should spend more than this on an hdmi cable. Search for cnet's "why all hdmi cables are the same" articles. Don't believe them? Check consumer reports. 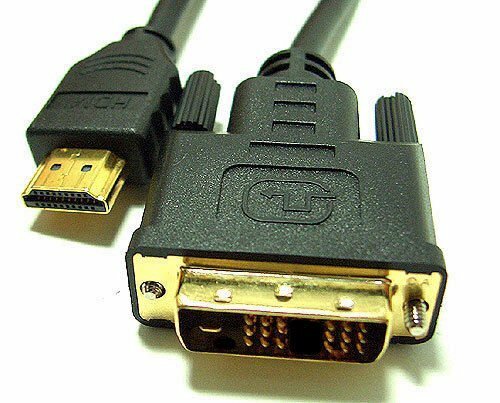 Any well-made high speed (c2) hdmi cable will carry 1080p, 3d, 4k -- why do you think you need this? -- video (60hz, 120hz, 240hz tv doesn't matter) and digital audio. The hdmi tmds standard uses two sets of wires to transmit the signal, one out of phase with the other. The receiver inverts one set and combines it with the other, thereby cancelling any in-phase noise that is picked up along the cable, just as balanced audio cable does. If you need extremely long cable, you may need heavier gauge cable. If you move your components around frequently, you may want a more limp cable and you'll have to pay for it. For the usual 6-10ft cable and components that stay put, spend your money on better components or more movies. I used it to connect my ipad to a external monitor. It works! It's a good quality cable you won't regret. I am using this for my macbook pro retina to make a dual headed display. I started off with an expensive usb video adapter to make the dual head display, but the adapter's resolution made the display look odd. This solution was cheaper and it worked perfectly for my needs. I was looking for a way to connect my macbook pro to the tv without an hdmi port on the mac. Found this adapter to connect with the dvi input on the mac. I connected audio through the headphone jack using 3.5mm to female rca adapter. I used a sound loop isolator to cancel any humm and it worked perfectly. I now can use the more portable macbook instead of my pc to connect to t.V. Perhaps user error but i thought that the hdmi out of my computer would make the line work perfectly utilizing the ferrite cores (used some research to come to this conclusion) but it did not work. Oh well, perhaps i can utilize this cable for other things. Cable quality is, as usual for monoprice, excellent.Hdmi and single-link dvi are ellectrically identical, so if you don't need sound to be transmitted, this is a great way to link them up.My gpu has 2x mdp, 1xdvi, 1x hdmi. I have 1 monitor with dp, and two that have only vga and dvi inputs. 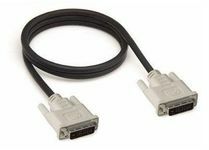 This cable allowed me to use all 3 monitors without having to worry about expensive active dp adapters.As an additional note, since laptop turnover is much faster than external monitor turnover, these can be great since almost all modern laptops have hdmi outs, and most older monitors they might be docking into have dvi inputs! Just be aware that the output is only single-link dvi, so this isn't going to help you if you're got one of those newer 27'' 2560x1440 (or higher!) res panels. Sl-dvi is good upto 1920x1200. Monoprice in my opinion makes the best cables for the money. Every hdmi cable i have bought from them has been quality and i have recommended them to others with great results. Idan, The cable weighs a total of 3.80 lbs on the scale.